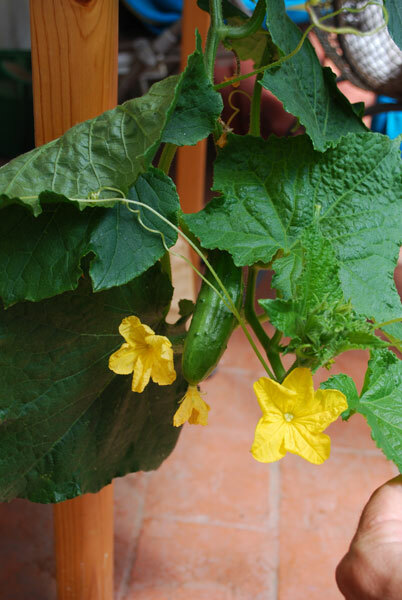 When growing cucumbers in containers, choose compact “bush” varieties, like ‘Bush Slicer’ or ‘Green Fingers’. These “bush” vines may still reach 4-5’ (1.2-1.5 meters), so they’ll either need something to climb on, or the pots can be placed on a high shelf or plant stand, and the vines allowed to drape down. Container cucumbers perform best in 5-7-gallon (27-35cm) pots, one plant to a pot. They do particularly well in 5-7 gallon (27-35cm) Smart Pots. When growing cucumbers in containers, it’s best to build organic soil amendments into the potting mix before you plant. Organic soil amendments provide not just nutrients, but endo-myccorhizae. Endo-myccorhizae create a fine, fibrous root structure that embraces every particle of the potting soil. They form a water-holding, nutrient-extracting web that reduces watering needs and creates healthy, vigorous container garden plants. 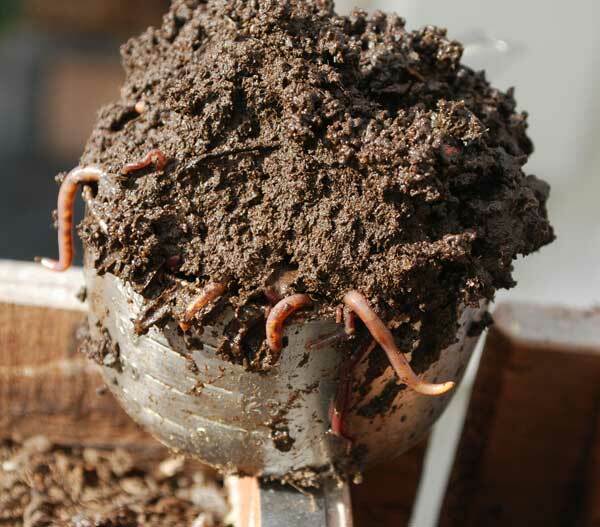 If you have a Worm Bin , fresh worm castings—with live worms—are a great addition to container gardening soil. Worm castings have both quick-releasing and slow-releasing organic nutrients, and they inoculate sterile potting mixes with beneficial bacteria and fungi that help fruiting vegetables like cucumbers thrive. The worms also cycle organic nutrients in potting mixes, converting them into plant-usable form at a slow, steady rate throughout the growing season. Use 2-3 cups of fresh castings per 5- or 7-gallon (27-35cm) pot. 1/3 cup of Ground Oyster Shell or Dried, Crushed Eggshells will provide extra calcium to help with flowering and fruiting. The leachate from your worm bin is also an excellent organic fertilizer. Dilute 50-50 with water and water your potted vegetable garden with it once a month. For more information on setting up a worm composting system, click Here. You can use dried Worm Castings as part of your container soil mix. Dried worm castings have the same nutrients and many of the same beneficial bacteria and fungi as fresh worm castings, but they’re dormant. You can also amend the soil with balanced organic fertilizer like Dr. Earth Organic Tomato, Vegetable, and Herb Fertilizer . First Cucs of the Summer! When growing cucumbers in containers, regular watering is the most important chore. Potted vegetables dry out quickly, escpecially in hot, dry, or windy weather. Most container vegetables need 1-2 quarts or liters of water per day in hot weather. Cucumbers have a wide leaf area, and may need more water than other potted vegetables. 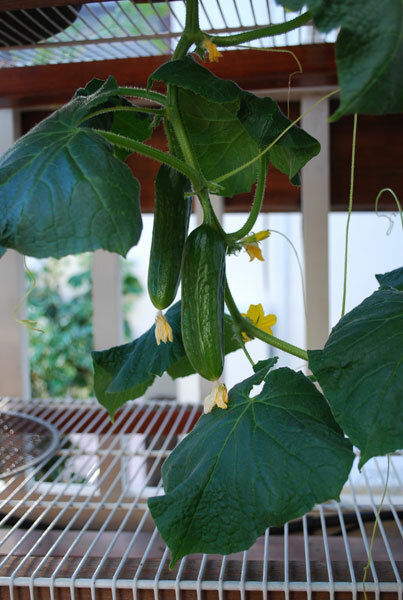 In very hot climates or exposed areas, cucumbers growing in pots may need to be moved to an area out of full sun. I have my potted cucumbers out of direct sun, under the diffused light of opaque Suntuf panels. This seems to prevent scorching of leaves. Potted cucumbers, like other container vegetables, are susceptible to a couple of pests not often found in field-grown plants: Spider Mites and Thrips. Both are nearly invisible pests early on, but can be devastating as their numbers increase. Adult thrips are tiny winged insects that you may see flying up from the soil surface when you water. 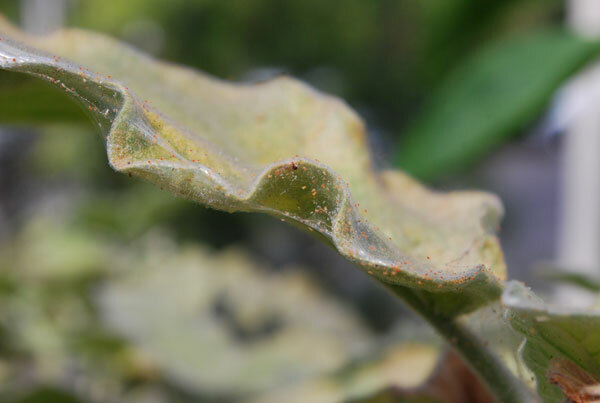 The nymphs cause most of the damage by gathering on the undersides of leaves, and sucking out plant juices. Cucumber leaf diseases often take hold in the injured tissue caused by thrips. 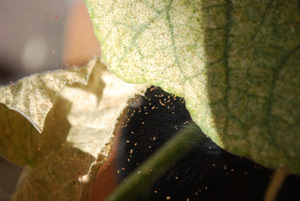 Spider mites are tiny red mites that gather on webs covering leaves. Like thrips, they cause damage by sucking nutrients out of leaves. 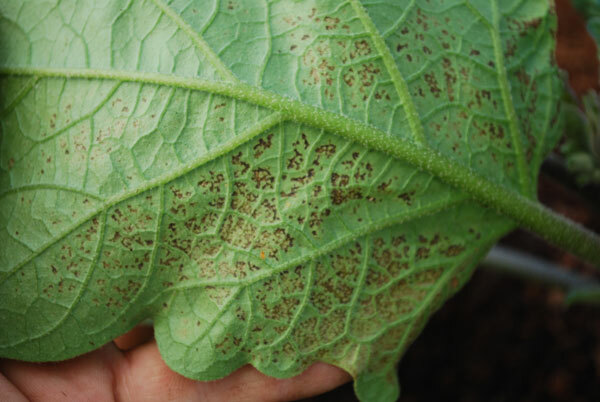 Both thrips and spider mites can be controlled with soap sprays. Cucumbers, like most summer vegetables, need support for the vines when they start getting heavy with fruit. One advantage of growing cucumbers in containers is that you can set the plant on a shelf or plant stand, and simply let the vines train below. 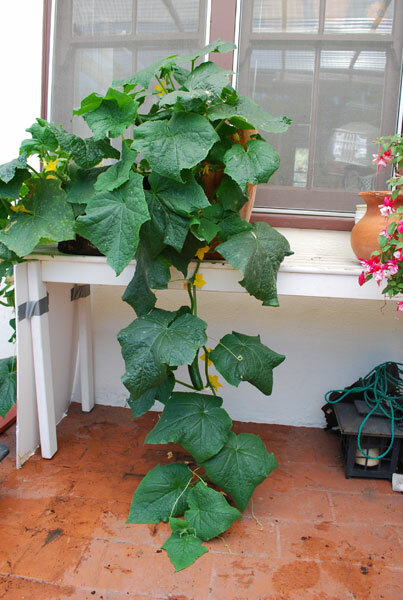 This is often easier than trellising cucumbers, but you can also set the pots on the ground or floor of the deck, and place a lattice trellis in the pot. The trellis supports the vines as they grow up through it.